The Woolloomooloo playground is on Dowling Street in Woolloomooloo and is a great little park if you're visiting the city. This playground is down the road from the the Art Gallery of New South Whales and the Domain car park. It is a great playground for all ages. It has a main structure with stairs or areas to climb from. Both sides have a net bridge where children can safely walk through. One side has a slide on the other end whereas the other has a cubby house which can also be accessed via a climbing ladder. There is also a cubby like area on the ground level of the structure for kids to pretend play and a spiderweb climbing spot as well as a balancing plank. There is also a nearby set of swings, one for bubs and the other one for older kids. It is a great little playground which has a fence on the street side however it is not fully enclosed. The playground has a rubber surface for low impact however it has no benches, it gets part shade from trees however there are no toilets onsite. There is also a community basketball court and a community garden adjacent. Grab a hat and some sunscreen for the little ones in summer. Be aware that this playground is not fully fenced just in case for little wonderers. You can grab a coffee and some yummy gingerbread biscuits a 10 min walk from the playground at Flour & Stone on Riley Street. Plan a trip to the toilets before heading to the playground as there are no toilets onsite. 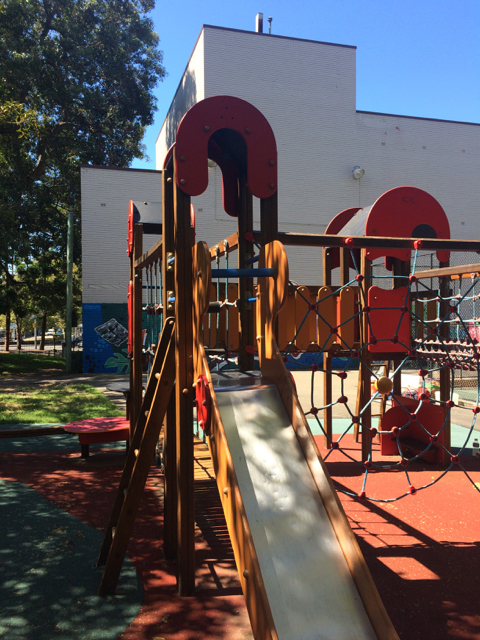 For more Sydney playgrounds, go to our dedicated page.